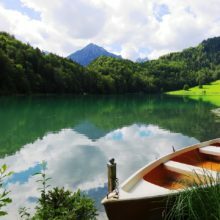 In the summer, many people try new activities like water-skiing, hiking, biking, and running on different terrain for the first time. While enjoying the summer sunshine and outdoor activities, and perhaps some R&R, you may want to center your mind on your core. It’s more important than you think! Where is your core? What muscles does it consist of? Why is core training so important? Our powerhouse is the center of strength for our bodies, as the mitochondria is the powerhouse of a cell. Your core muscles are from shoulder to shoulder, hip to hip, and your lower back musculature. Main core muscles include: rectus abdominis, transversus, internal and external obliques, erector spinae, and the pelvic floor muscles. 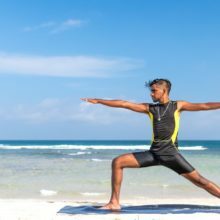 Core strength is important whether you are standing, sitting at a computer, side bending, running, swimming, salsa dancing, playing tennis, golfing, or even shopping. A strong core helps to better execute arm and leg movement during activities, prevent back pain, improve posture, allow for better breathing, secure strength for the spinal column and rib cage, and support balance during movement. When it comes to posture, people often neglect activating their abdominals. We often think of standing tall, with our shoulders back and chest lifted high. However, many people tend to exaggerate the arch in their low back, lumbar. We should engage the abdominal muscles to strengthen the core, to improve posture, whether you are standing up, or sitting in a chair and yes, even while you are on vacation! Sitting tall again, hips stationary, knees hip width apart. Place your hands behind your head, elbows wide. Inhale, twist your torso to the right, exhale, pull abs in. Inhale back to center, exhale and twist your torso to the left. Repeat 5x. This will activate your spine extensors as well. Now, here are some more core strengtheners for those summer activities! In a plank position on forearms and elbows under shoulders, palms flat, keeping your inner thighs together. Pull your navel in to engage ab muscles, to prevent arching your low back. Inhale, and bend your right knee, point foot to the sky, exhale, and pull your abs in tight. Inhale again, exhale release foot to the floor. Inhale, bend left knee, and lift left foot to the sky, exhale. Inhale, release foot to the floor, exhale. Repeat sequence 5 x each side. Lying on your back, spine in neutral, with no arching/space in the low back. Hands behind head, chin tucked slightly, elbows wide. Knees bent, feet flat on floor. Inhale and twist right elbow to left knee, lifting knee to 90 degrees, exhale, engage abdominal muscles. Inhale release, exhale bring your left elbow to your right knee, lifting knee to 90 degrees, exhale, engage abs. Remember to keep elbows wide and work from your abs and side, refrain from pulling on your neck. Repeat 5x each side. Repeat the above exercise with one leg straight a few inches off the floor, opposite elbow to knee, exhale. Inhale, switch to the other side, opposite elbow to knee, and exhale. Repeat 10x. Lying on your back, in neutral spine. Place hands behind your head, elbows wide, chin slightly tucked in. Extend your right leg out a few inches off the floor. Inhale and lift your leg as high as the other knee, lift your head a few inches, until you feel your abs engage, and exhale. Inhale, release your head and leg, exhale lift leg and head, pulling your navel to your spine. Repeat 5x. Repeat with the left leg 5x. To make this bridging exercise even more challenging, start in a bridge position. Inhale and extend your right leg and lift it to the sky, straight up, exhale. Inhale and lower straight down, just to the knee, exhale and lift straight back up. Repeat 5x on each side. And voila! Now you now have a great base of exercises to strengthen your center for those summer activities!